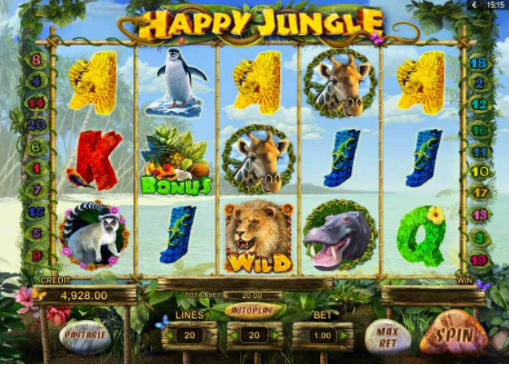 Deposit today and enter the Happy Jungle, where Wild animals are your friend and the online slots games just keep on spinning. Happy Jungle Deluxe is set on a beautiful tropical beach filled with coconuts and white sands. Featuring 5 exotic reels Happy Jungle allows you to spin through grinning monkeys, flowered letters, and friendly giraffes. Spin today and play slot games online! Playson’s portfolio is so diverse that it has a slot game for every taste and preference, making it one of the most versatile companies in the online slots industry. Their developers are dedicated to offering players a more than satisfactory experience both for their hearts and their pockets, always eager to improve their themes and gameplay. Happy Jungle Deluxe takes players on an expedition through the vast jungle and among all the exotic and interesting animals that live there. Get a free spins if you pay by mobile slot. What place could be more relaxing than the beach of a secluded and quiet island, where one can rest and forget about the monotony of daily life? If that’s not enough, you can go explore the jungle, with its impressive wildlife and abundant vegetation. Happy Jungle Deluxe comprises all of the above, plus big chances of coming across a treasure you can take back with you. The lemurs, hippos, chameleons and other friendly creatures will guide you towards the best winning combinations, while you sip on a fruit cocktail and enjoy the sun and nature. This slot game has 5 reels and 20 generous paylines. You won’t need a holiday anymore after you start playing, because it has the perfect atmosphere to make you wind down and imagine yourself in a completely different place. The upbeat music and birds chirping in the background are enough for you to close your eyes and travel to this jungle island. The 3D graphics are beautifully used to create the reels surrounded by palm trees and the blue ocean. Once you are convinced this is the right slots experience for you, you can bet between 0.20 and 60 credits and start spinning, while the animals are watching with excitement. We also often run various slots bonuses with this game. The features and symbols of Happy Jungle Deluxe are quite fun. There are exotic fruit and several majestic animals that you can look at on the reels, watching as they bring you prizes. The Wild Card of the game is the fierce lion symbol, and it substitutes any other symbol besides the Lemur and the Bonus, in order to form more winning lines. The Lemur is as special as it is rare, since its wins are paid independently of the bet lines. Finally, the Bonus Fruit symbol activates the Bonus Game, when you spin 3 or more of them. There are 4 levels in this Bonus Game, represented by 4 rows of doors you can choose from. On each level, you can choose one door to potentially reveal a thrilling prize. If there is nothing beneath the door, the Bonus ends, but if you find fruit, you can collect prizes ranging between 180 and 1.500 credits, and the value increases on each level. Then, you go to the next level and if you reach the last one, you are awarded an extra 25 Free Wins. There’s so much to be won in the jungle! For more information, refer to easyslots.com. Happy Jungle Deluxe is an exciting adventure among the wild animals in the jungle, with lots of features that have the potential to reward you with massive prizes. It is certainly a slots experience you won’t regret. Now check out our Gem Rocks, Join & spin now!